CHAPEL HILL, NC -- Theo Pinson scored 14 of his 16 points after halftime to go with 10 rebounds, helping No. 14 North Carolina pull away late to beat Notre Dame 83-66 on Monday night. Joel Berry II added 21 points for the Tar Heels (20-7, 9-5 Atlantic Coast Conference), who closed a tough stretch with their third game in five days. The first two were emotional rivalry wins, the first coming at home against Duke and Saturday's coming at North Carolina State. This time, UNC needed a 13-0 burst in the final 5 minutes to finally get some separation against a team that just kept hanging around. North Carolina's Kenny Williams drives for a shot against Notre Dame's Austin Torres on Monday in Chapel Hill. Top scorer Luke Maye struggled to just eight points on 3-for-11 shooting after scoring 33 at N.C. State. But UNC still shot 57 percent after halftime for a fourth straight win. Martinas Geben and John Mooney each scored 18 points for the Fighting Irish (15-11, 5-8). Notre Dame: The Fighting Irish have been just trying to stay afloat with preseason Associated Press All-American Bonzie Colson sidelined with a broken foot. They had lost seven straight - point guard Matt Farrell missed some of that time with an ankle problem - but they had found a bit of a groove since with consecutive high-scoring wins as Farrell returned to health. 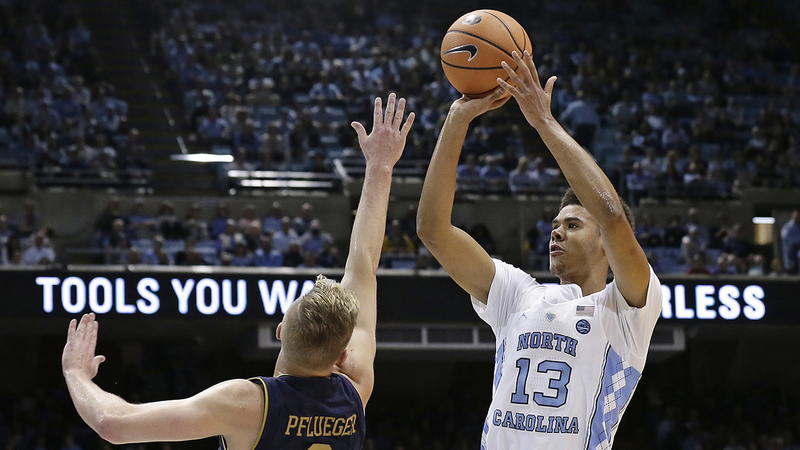 They were right in this one, trailing just 67-63 before UNC's clinching run, despite Farrell scoring nine points on 3-for-18 shooting (including 1 for 12 from 3-point range). "He's a tough little nut," UNC coach Roy Williams said of Joel Berry II.